Seeing as I am about to embark on a birthday holiday and September is the season for birthdays (nine months after new years…use your imagination…or not) I decided an easy gift giving idea was in order. 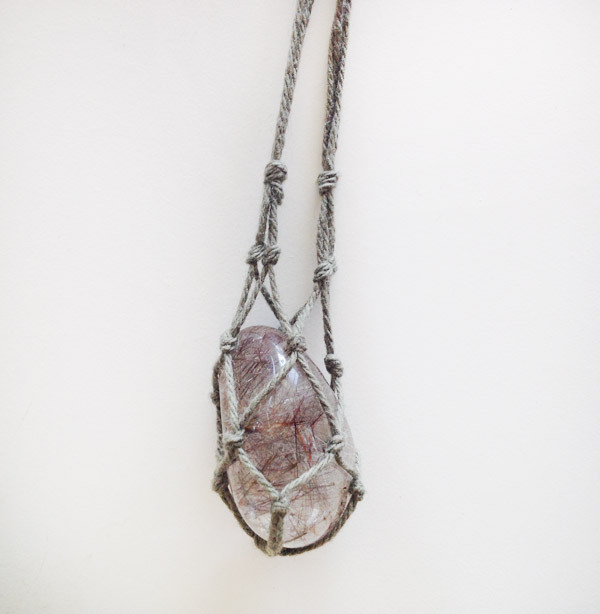 Macrame gemstone necklaces are not only easy to make they can be a very personal present when you choose the specific crystals or trinkets you would like to store in it. waxed cotton or crochet cotton- I have made them using both options before and they are equally as good, but photographed is crochet cotton option. beads- optional but good for holding stones in place. 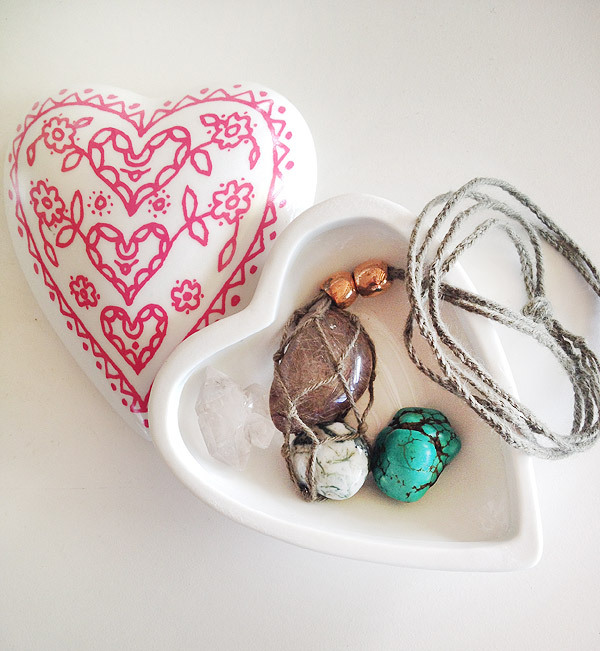 stones or trinkets- gemstones are great options but this project can be used for shells, coral or bone. around an hour (the four way braid takes a little while). First up you will need four equal lengths of cotton, the length is up to you but will determine how long your necklace will be. Remember that braiding and knotting will take up some thread length. Each one of my equal lengths were around 2.5 meters long for this project. 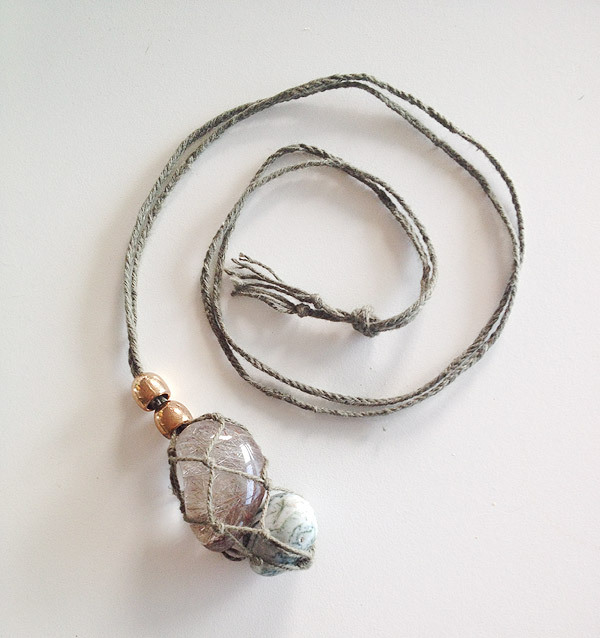 Separate the strands into pairs and tie a knot in each pair, you will have to keep in mind the size of the gem stone you would like the bag to hold. If the gems are small your paired cotton knots will be tied lower down (near the base knot) creating a smaller weave so stones don’t escape. 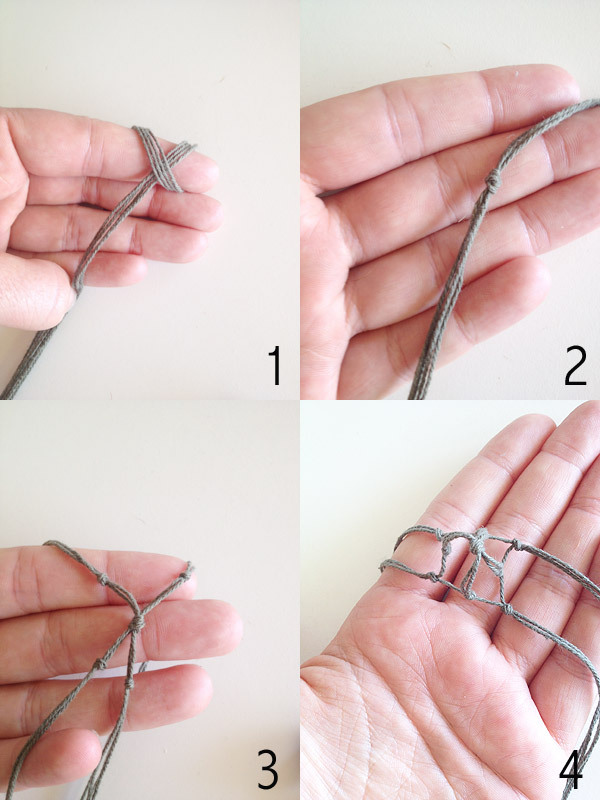 From your paired knots you can tie each individual strand to its neighbour. You will notice as you do this that a ‘bag’ shape starts to form. You can keep tying neighbouring strands together until you get the ‘depth’ required for the gemstones you have in mind. Again the size of holes the ‘netted bag’ you are creating will be determined by the size of the gemstones you would like it to hold. Once you have the depth required you will take four strands in each hand and tie a knot at the top of the ‘bag’ on each side. This will leave you with two ‘necklace’ lengths, each with four strands of cotton. From here you will four strand braid each side of the necklace together (this is the longest part of the whole project). 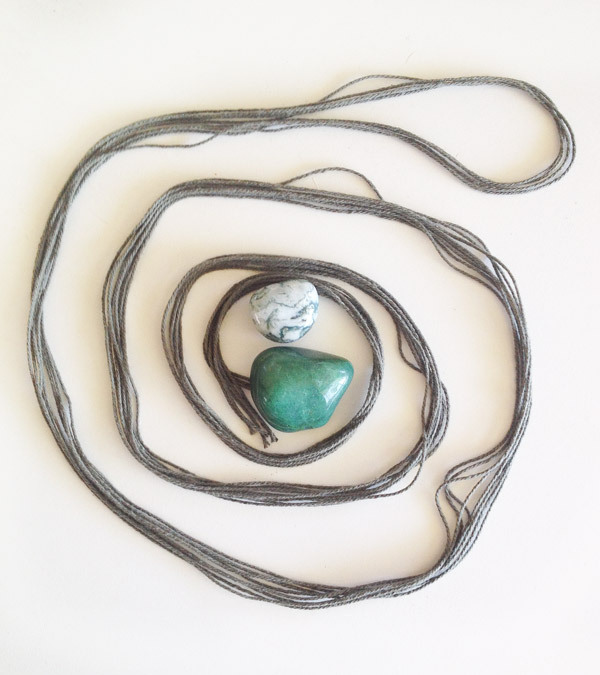 When your braids are complete knot the end of each strand so they don’t unravel, then slide your bead/s over both strands to sit at the top of your gemstone bag. 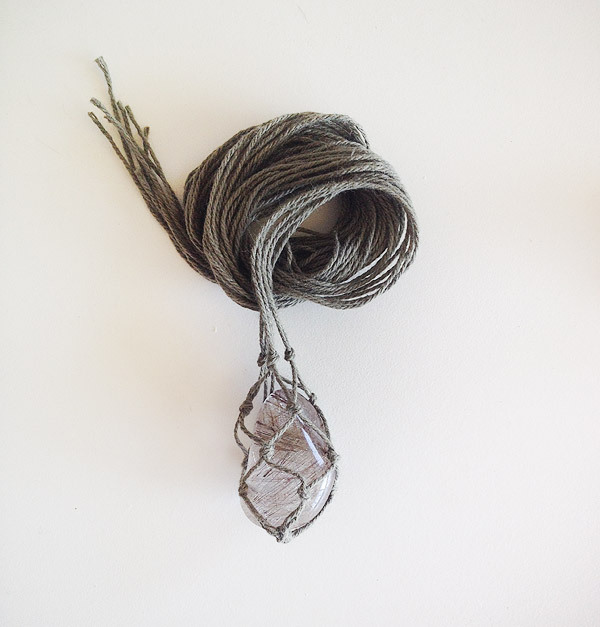 Then tie both of the braids together at your desired necklace length. There you have it. A super easy (and dare I say it, inexpensive) way to keep all the fussy Virgo’s and some balanced Libran’s that sneak in at the end, happy for the September birthday month. NextDay 327: Friday, How I would Love to Buy you a Drink! Do u sell these necklaces? What website is it on I’m new to this. This is my personal blog dedicated to all things fashion, sustainability and science (with the odd DIY thrown in). Thanks for dropping by! I love this, thanks for sharing! Ive been looking for these for a long time, now i feel confident i can finally make my own! So glad to hear that you enjoyed this tutorial George! Happy crafting. Is the cotton you use considered a twine? What its mm? 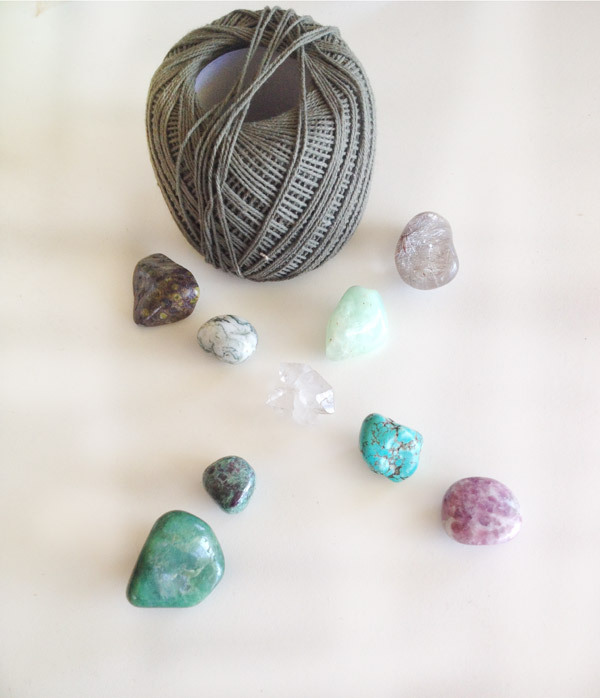 I am trying to wrap some tumbled stones and having trouble with the knots. Thanks. It’s just a crochet cotton. It knots pretty easy. A couple of years have passed since I last did this but this is the reply I had to Robyn who had a simmilar question. Thanks for stopping by. I have no idea of the thickness or brand. It was just one that I already had in my sewing box and it doesn’t have any labels on it. From memory it might be 4ply? You could use any thickness that appeals to you and the desired look you are after. I love these necklaces! Where do you get your stones from. Is there a certain website or place you could recommend? I got my stones from the local holistic wellbeing centre. But you can find ethically sourced stones on websites like this one. 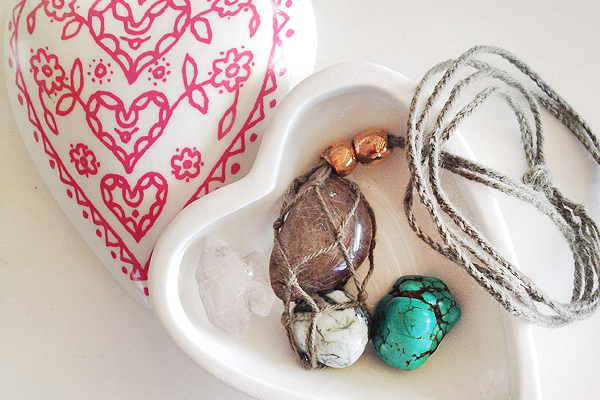 These necklaces are nice with stones you have found or been gifted too. They also look nice with coral or seashells. 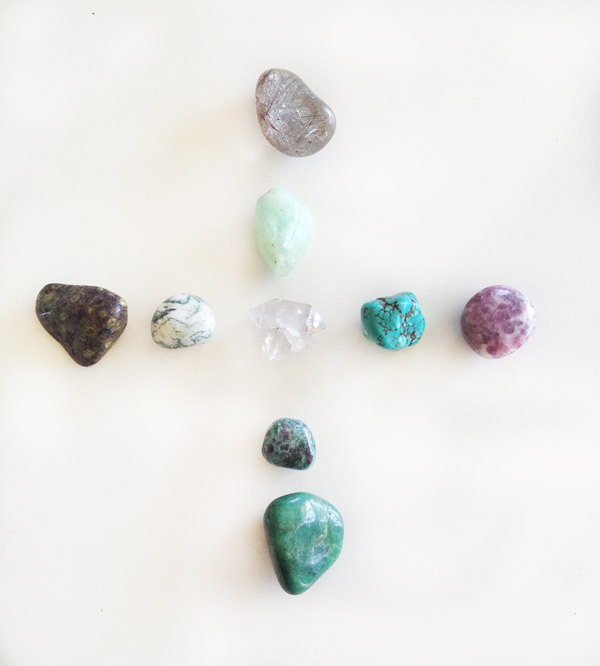 Etsy also has a TON of crystal and stone shops. P.S. 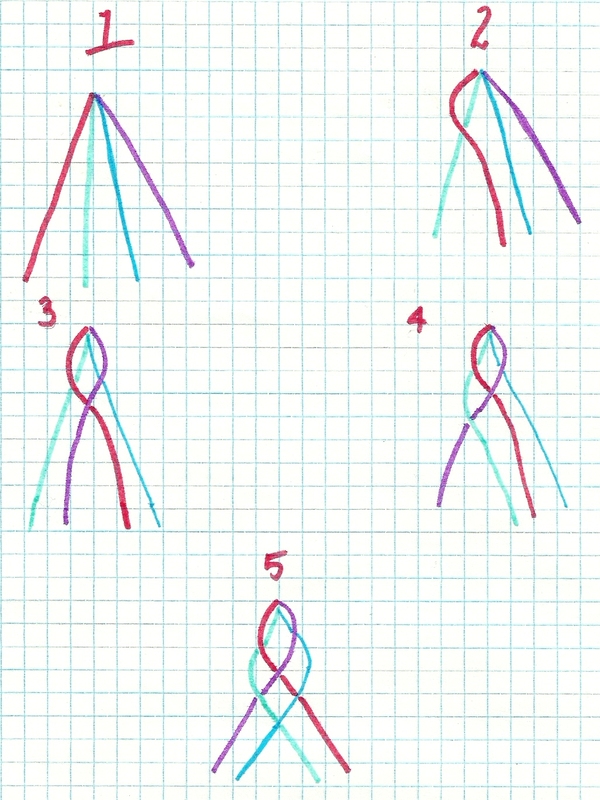 An alternative way to do this is to start with eight strands rather than four and tie the initial knot at one end, not in the middle. This way the bottom has a little bit of fringe. Ah thats a Clever alternative Kirsten! The fringe would be super cute. Thanks for the heads up about crystals and stones on Etsy! hello! I really loved this tutorial, I’m planning to make one for myself soon! I love your website and all your tutorials! Is your length really 2.5 meters per strand? That is like 8 feet. I just got my string and want to make this but want my length to be correct so I don’t run short braiding it. Thanks! All depends on how long you want the necklace and how tightly you braid. But yes, if you want a necklace that hangs low then longer lengths are required 🙂 It seems excessively long and can be difficult to braid with without tangling but this length worked for me. Hi there which crotchet cotton did you use and what thickness ? Thank you for sharing your time and talent. I love the way you also answer the people who reply to your post. Awww thanks Teri. It’s lovely to hear from you. I agree, stones are very powerful tools and can be great talismans too 🙂 Yes, it’s great to have metal free options, especially for those with metal allergies. Thanks again for stopping by and taking time to comment. Thank you so much!! This is by far the best instructional I’ve seen for these necklaces! Thank you so much for explaining it so easily and clearly! Thank you so much for sharing. This necklace is lovely! You do beautiful work. I just made one of these & it is absolutely BEAUTIFUL!! Thank you so much for the instructions, you’re a champion! Awww thank you Lauren. I’m so glad that you enjoyed it and got great results. Wishing you many happy necklace wearing days. I was wondering if you could do this with hemp? I found some very pretty tie dyed hemp and thought it would be lovely. This is beautiful.I wish I had your kind of talent! Awwww thank you! It’s quite easy and I’m sure you can make it too. I love this, Thanks for sharing such a informative blog with us. I will definitely try this for me and i am waiting for your next blog. I had a friends daughter make me 1 for my birthday a few yrs back but it was a anklet. I thought it was awesome the way she did it. I came across ur tutorial & straight away saved it. I have always wanted to learn how to make the necklaces since I have an abundance of crystals & let’s face it ur bra can only hold so much lol.